12 hours agoPaper Straws Pop Up in Magic Kingdom13 hours agoMenu Mania: Cookie Dough, Cupcakes, Cinco de Mayo, Mother's Day, and More Menu Updates!13 hours agoMagic Kingdom's Parking Lot Trams Relocated While TTC Under Renovation20 hours agoDisney Pic of the Week: Monorail Transportation1 day ago"Rivers of Light" Nighttime Show at Disney's Animal Kingdom to be Updated2 days agoHow to Get the Best View of Disney World Fireworks and Shows3 days agoIs Disney Trying To Change The Way You Travel? 1Photos: Otters Have a New Grotto at Disney's Animal Kingdom! Mickey and Minnie's Runaway Railway - OPENING 2019! STAR WARS: GALAXY'S EDGE - AUGUST 29, 2019! Millennium Falcon: Smugglers Run - AUGUST 29, 2019! Star Wars: Rise of the Resistance - LATE FALL 2019! Disney’s Hollywood Studios began as a single-attraction concept, to be placed in Future World at Epcot. Marty Sklar and his Walt Disney Imagineering team envisioned this “entertainment pavilion” as a three-part experience: Give guests a presentation that highlighted great moments in the movies, then show them the behind-the-scenes chaos of a day at a television studio, and finally, present a radio-themed attraction that showed the importance of sound and special effects. 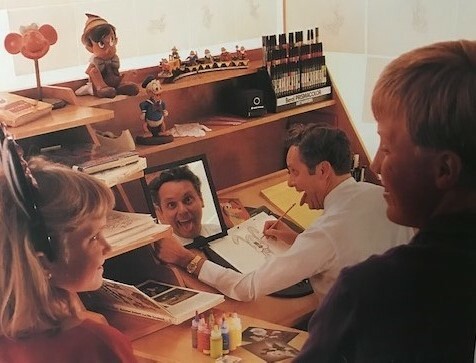 After the idea of a single attraction was shelved in favor of an entire theme park based on a real working TV and movie studio, the Imagineers got to work. 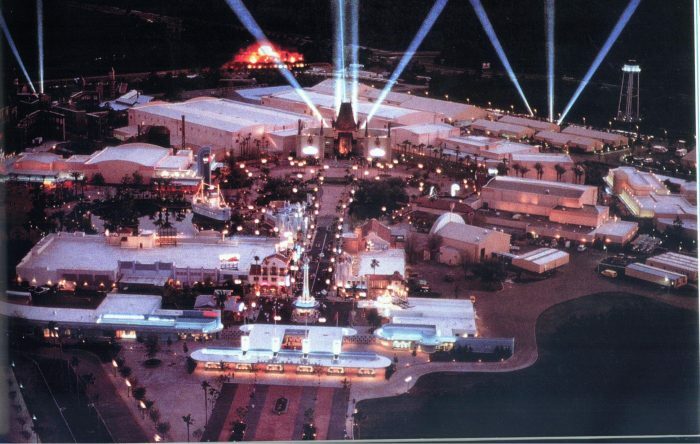 Each of the three elements to be featured in the entertainment pavilion were expanded and became single attractions unto themselves at what opened on May 1, 1989, as the Disney-MGM Studios. Those three attractions were up and running when the park opened on May 1, 1989. Rounding out the opening-day lineup was The Magic of Disney Animation, a walk-through attraction where guests could watch as dozens of animators worked at their desks; The Backstage Studio Tour, featuring Catastrophe Canyon, where costuming, set shops, sound stages, backlots and post-production came out of the shadows to take center stage; and Theater of the Stars, featuring a lavish production of the latest hit Disney animated movie. The new theme park was located about a mile from the back entrance to Epcot’s World Showcase. The park’s entryway was based on the Streamline Moderne style of architecture featured on the legendary Pan-Pacific Auditorium in Hollywood. Once inside the main gate, guests could turn left to visit Sid Cahuenga’s One-of-a-Kind, a bungalow-style building where movie memorabilia and Hollywood-themed collectibles were on sale. Oscar’s Super Service looked like a typical L.A. gas station … but in reality, it’s a stroller and wheelchair rental facility. 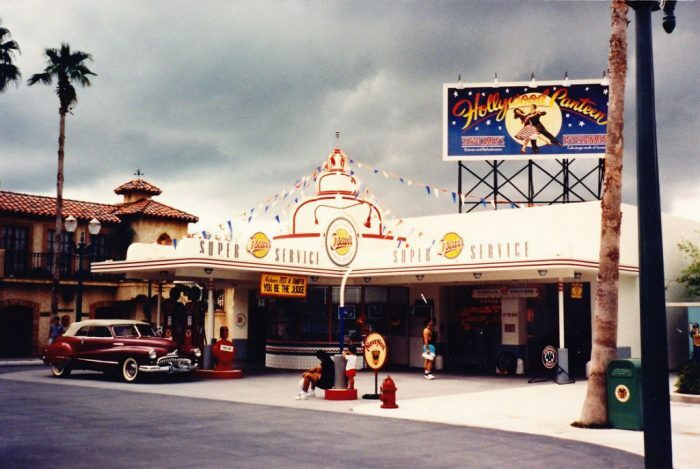 To the right was Oscar’s Super Service, a replica of a typical L.A. service station from the 1940s. Outside, a vintage Buick was pulled up to the gas pumps, while period billboards on nearby rooftops served as an interesting backdrop. Inside, guests could rent infant strollers and wheelchairs. From the entry plaza, known as the Crossroads of the World, guests walked up Hollywood Boulevard, the Studios’ version of Main Street U.S.A., where distinctive Art Deco styles and familiar Los Angeles building facades abounded. Store fronts, such as Mickey’s of Hollywood, the Celebrity 5 & 10 and Keystone Clothier, took their cues from landmark L.A. structures. Because the Disney-MGM Studios was designed to also be a full working studio, there were features that had never been seen before in a theme park, such as a section of an actual Delta Airlines L-1011 fuselage. The plane – in reality, the first 65 feet of the aircraft, from nose to wings – was reconfigured to serve as a movie set. The mockup was used for filming and photographing commercials, promotional shots and in-flight demonstration videos. Once guests made their way into the park, they saw vintage 1930s automobiles parked on the streets, and “Streetmosphere” actors and actresses in period costumes performing for guests – everything from roving reporters to autograph hounds to talent scouts. The park’s restaurants were themed to Hollywood or television, including the ’50s Prime Time Café and a replica of the Hollywood Brown Derby. When it came to attractions, the park on opening day was half rides, half boarded-up construction sites, “for your future enjoyment.” Regular Walt Disney World visitors could afford to be patient; first-time guests and those infrequent visitors to the Orlando area were disappointed. “There’s just not very much there,” was a constant refrain. Those cries wouldn’t diminish until Disney caught up to the demand in the months and years ahead. Here’s a closer look into each Disney-MGM Studios opening-day attraction. Of note: With the closing of the Great Movie Ride in 2017, all these attractions have faded into Disney lore. The Disney/Metro-Goldwyn-Mayer collaboration enabled Disney’s planners to tap into MGM’s catalogue, where many of the featured scenes in the Great Movie Ride originated. The building that housed the attraction was a replica of Grauman’s Chinese Theater, a Hollywood landmark that hosted numerous Academy Awards shows and movie premiers, including Disney’s Mary Poppins and The Jungle Book. Your adventure began in the winding queue area, where guests waiting to board studio trams were treated to a montage of several classic movie scenes. A colorful panorama of the Hollywood Hills greeted guests as they boarded the studio trams, which were actually rows of theater seats on wheels. The tram was guided by a wire that was embedded in the floor. A studio page served as the guide as the multi-passenger vehicle glided past a Hollywoodland sign and under a glittering movie marquee, into a fantasy world of celluloid villains and heroes. The first stop was into the glittering world of movie musicals. A scene from Busby Berkeley’s Footlight Parade – complete with 60 dancers poised atop a giant multi-tiered, revolving faux cake – greeted guests, stage right. To the left a few feet away, a figure of Gene Kelly swung from a lamppost as he belted out the title song from Singin’ in the Rain. Bert and Mary entertained us with a chorus from “Chim Chim Cher-ee” while atop London’s rooftops in a scene from Mary Poppins. The tram quickly went from fun and fancy-free to the gritty, grungy world of gangster films. An Audio-Animatronics figure of James Cagney, straight out of Public Enemy, greeted guests as they rode into Chicago’s underworld. Further along the backstreet, the tram got caught up in the crossfire of a mob shootout. From the Chicago gangster scene, the tram traveled back in time to the Wild West, where John Wayne, seated atop his trusty horse, warned us “pilgrims” to be wary of what was ahead. A bank heist, with another shootout, made for some tense moments. The highlight of this scene came with the bank burst into flames … at which point, depending on luck, one of the villainous gunslingers commandeered the tram, leaving the guide to fend for himself or herself. Next up: The world of Alien, where Sigourney Weaver’s character had a look of terror on her face as her spaceship Nostromo was about to be overrun by extraterrestrials. The tram then rolled through the well of souls from Raiders of the Lost Ark, where our original guide miraculously reappears to retake the vehicle. Then it was on to a lush jungle setting, where Jane watched from atop an elephant as Tarzan swung through thick vines, before Ilsa and Rick say their final good-byes on an airport tarmac in the scene from Casablanca. The most memorable scene from the attraction was the meticulously recreated Munchkinland from The Wizard of Oz. There was the house that fell on the Wicked Witch’s sister (who could forget the shriveled feet sticking out from under the house? ); the dozens of Munchkins from the Lollipop Guild, many peeking out from windows in colorful, rounded houses; the Yellow Brick Road; Dorothy, Toto and the stunning appearance of the Wicked Witch, who rises up from behind a cloud of smoke. After the witch disappears, the Munchkins encourage Dorothy to “follow the Yellow Brick road.” As we exited Munchkinland, we saw Dorothy, the Tin Man, the Cowardly Lion and the Scarecrow gazing at Emerald City in the distance. The Great Movie Ride culminated with a three-minute movie montage featuring clips from some of Hollywood’s most memorable films. The attraction was closed in 2017. It is scheduled to be replaced by Mickey and Minnie’s Runaway Railway this year. Legend has it that many of Hollywood’s greatest stars were “discovered” while doing everyday things … shopping in a department store, sipping a drink at a soda fountain or just walking down the street. When SuperStar Television was up and running, a “casting director” would scan the attraction’s queue area for just the right actor or actress to play opposite some of TV’s most enduring stars on some of TV’s most beloved shows. Prior to each performance, up to 30 guests were chosen to take part in the often madcap re-enactment of a TV station’s typical broadcast day. Camera operators filmed the actors as they recited lines on each show’s set. As they performed, guests in the audience would watch the action on six-foot-wide Sony SuperBright screens. But by using blue-screen technology, the live actors’ performances were merged with clips from classic shows, creating a hilarious mash-up. The more nervous or out of sync the guest was, the funnier the scene became. Once the neophyte TV performers were chosen and the rest of the audience was seated in the 1,000-seat studio theater, the fictitious station’s broadcast day began. The “Today” show kicked off things bright and early in black-and-white, which was typical of TV in the 1950s. The day was July 18, 1955 … which just happened to be Disneyland’s first official day of operation. Legendary newsman Dave Garroway introduced the morning’s news segment, which was delivered by a SuperStar TV guest. Programming jumped from real news to the classic children’s show “Howdy Doody,” where everyone in the audience sang the show’s catchy theme song. SuperStar Television’s prime-time lineup gave guests the chance to star in any one of several classics and live news events from the 1960s, 1970s and 1980s. One lucky “cowpoke” rode a “horse” into the opening credits of “Bonanza”; a “stagehand” unwittingly wandered onto the set during the broadcast of the Apollo moon landing; other guests joined the cast as “Gilligan’s Island” began; four guests were asked to take part in a segment from “Golden Girls” – two played neighbors of Blanche and Sophia, while two others played FBI agents. Late night TV was well represented on SuperStar Television: A guest in a baseball uniform was interviewed during “Howard Cosell’s Sportsbreak,” while another got to “chat” with legendary host Johnny Carson on the “Tonight” show. During the performance, even members of the audience got into the action as cameras would zero in on a group of guests and feature them on the screen. SuperStar Television ran until 1998. It was replaced by Doug Live!, which debuted in 1999. That attraction lasted a few years before it was replaced by the American Idol Experience. In 2015, a Frozen Sing-Along show took over what is now known as the Hyperion Theater. The entrance to The Monster Sound Show attraction. Sound effects are such an important part of TV and movie production that they hand out Emmys and Grammys to the folks who excel in the often misunderstood craft. 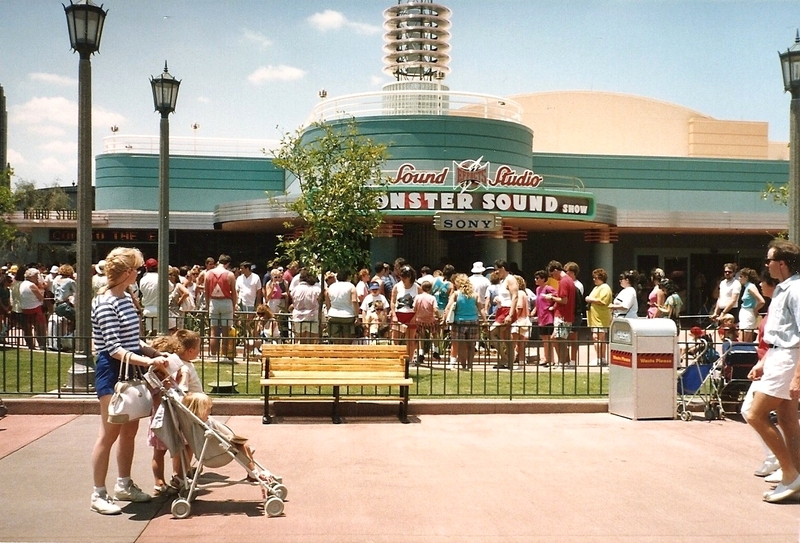 At Disney’s MGM-Studios, sound took center stage at the Monster Sound Show, giving members of the audience the chance to create sound effects for a film. Guests entered the 272-seat theater, where four “lucky” folks were selected to be Foley artists – Foley being the sound effects system named for its creator, Jack Foley. The audience and the four-person crew then watched a short horror-themed film set on a dark and dreary night, where the prominent and unmistakable sounds of thunder, rainfall, creaking doors and shattering glass are heard. Actors Martin Short and Chevy Chase were the featured stars of the show. The four Foley artists were then positioned at various pieces of sound effects props (all created by Disney Legend Jimmy Macdonald, the former voice of Mickey Mouse who was responsible for devising more than 20,000 sound gadgets during his career), and the film is played again … only this time, with the sounds turned off. It was up to the fledgling Foley artists to recreate the sound effects at the exact moment they had occurred in the film. The segment was recorded and then played back … with hilarious results. “If the sounds do not correspond to the film action – a door knock comes a split second after it appears on the screen, for example – the results can be surprising and very funny,” said Mike West of Walt Disney Imagineering and the show’s producer. After the show, guests entered SoundWorks, a post-show area, where there were plenty of hands-on activities available to try out. There was Earie Encounters, where guests could attempt to recreate a flying saucer sound effect; Movie Mimics gave guests the chance to dub in the voice of Roger Rabbit; and Soundsations was an adventure in 3D audio – an enclosed room was filled with realistic atmospheric sounds. The original Monster Sound Show ran until 1997, when it was updated to a more kid-friendly attraction. In this incarnation, seven young park guests were invited to add sound effects to popular ABC-TV Saturday morning cartoons. In 1999, the show was again updated and became Sounds Dangerous, starring Drew Carey. After a 10-year run, Sounds Dangerous was relegated to seasonal status and often went unused. In 2015, with a ramped-up Stars Wars presence in the park, the facility became home to Star Wars: Path of the Jedi, a 10-minute “greatest hits’ presentation, featuring many of the movie franchise’s most popular scenes. The premise of the Magic of Disney Animation in the park’s Animation Building was to give guests the opportunity to see actual animators produce a new generation of animated films. During a section of the tour, guests could watch from behind glass enclosures as artists worked on producing a short film. Guests “will be surprised by the number of people and the amount of time it takes to create these top-quality featurettes,” said Max Howard, director of operations for Walt Disney Animation Florida. Dozens of Disney artists were imported from the Disney Studios in California to Florida. In fact, on opening day, the animation team consisted of about 70 members – eight animators and a host of editorial, photo and effects experts. While on the surface, the concept behind the Magic of Disney Animation was sound, it turns out the idea of hand-drawn animation in and of itself was about to go the way of the dinosaurs. Your tour began with a display called The Disney Animation Collection, a gallery of drawings, sketches, backgrounds and transparent plastic sheets called “cels” – all featuring characters from some of Disney’s most revered animated classics. Also on display were 15 Oscars won by Walt Disney Animation. Guests then moved to the Disney Animation Theater, where an eight-minute film, Back to Neverland, was screened, detailing how an animated feature is developed. It starred Robin Williams and veteran TV newscaster Walter Cronkite. “When our guests leave that film, they have an understanding of how fascinating and complicated the animation process is,” said Howard. Indeed, one of the many facts gleaned from the tour was the fact that it took 24 frames to produce just one second of film on a screen. Guests then moved on to a glass-enclosed area where they could watch Disney animators at their desks, creating actual artwork – in the truth, the bread and butter of the attraction. The finale of the tour was another film, called Classic Disney, where memorable moments from Disney animated classics were shown. Over the years, the Animation Building morphed into a character meet-and-greet area. Currently, the Star Wars Launch Bay holds sway, where guests can get up close and personal with a variety of intergalactic characters – both in person and on screen – from the Star Wars universe. This elaborately recreated street corner could be seen along New York Street at the Disney-MGM Studios. Taking its cue from the Universal Studios Tour in Hollywood, the Disney-MGM Studios’ Backstage Studio Tour gave guests a long, winding and detailed look into the movie-making. There were many facets to the tour, everything from wardrobe and props displays to special effects and blue screen technology to a realistically recreated New York City street to a canyon on the brink of catastrophe. “Everything we’re doing on the Backstage Studio Tour is designed to give guests entertaining and informative insights in the magic and process of motion picture and television production, with opportunities for involvement along the way,” said show producer and Disney Imagineer Tom Fitzgerald. The tour lasted two hours and was part walkthrough, part tram ride. During the tour, guests witnessed how a big-screen sea battle, complete with roiling waves and machine gun blasts, was filmed using miniature ships in a Water Effects Tank. There was the classic demonstration of a tugboat pilot trying to keep the boat afloat in a storm-tossed tempest. Or guests could see for themselves how the famous “bee scene” was filmed for Honey, I Shrunk the Kids, using a giant bee, blue screen technology and youthful volunteers from the tour group. There also was a special-effects workshop, filled with gizmos and paraphernalia, from life-sized to miniatures, on display. Guests also could watch from sealed-off overhead walkways as actual filming for TV shows or commercials was taking place. Next came the tram tour, which gave guests a deep dive into the backstage area. On display during the tram ride was Walt Disney’s actual Gulfstream airplane – the one he was a passenger on when he and his team were scouring central Florida to choose a site for Walt Disney World – as well as life-size props from a variety of long-forgotten action films. You were taken to New York Street, where the faux buildings, distant skyscrapers, subway entrances and imaginative storefronts transported guests to the heart of the Big Apple. There even was a replica of the fabled arch located in Washington Square Park in Greenwich Village. 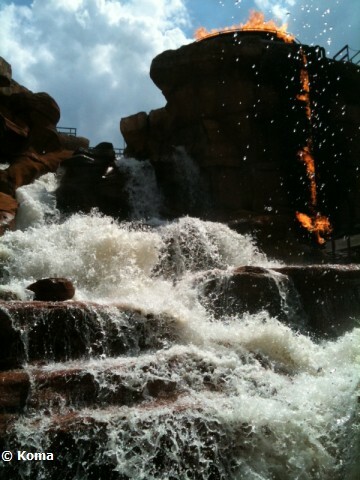 The grand finale of the tour was Catastrophe Canyon, where guests got to witness a seemingly controlled movie set take a decidedly frightening turn. The tram pulled into a set that resembled a rocky canyon road, surrounded by oil rigs and steep canyon walls. Those man-made walls reached 50 feet high and stretched some 200 feet in length. At first, everything seemed placid as the tram came to a stop. A tractor trailer rig parked innocently to the right didn’t appear to be a threat. Suddenly, the ground began to tremble as an earthquake appeared to be imminent. Stationary objects, such as telephone poles, began to wobble before sparks and explosions rocked the area and flames raced toward a large oil storage tank. As the truck erupted in flames, torrents of water come cascading down from the hilltops … heading straight for the tram! The spectacular finale of fire, water and an earthquake “is a startling and dramatic closing curtain to the show,” said John Gould, production designer. Over the years, the Backstage Studio Tour saw a number of changes. 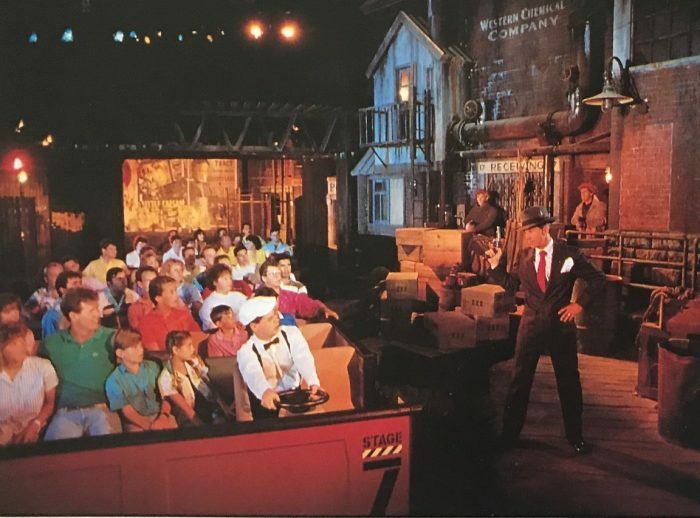 Many guests found committing two hours to an attraction to be too long, so the Backstage Tour was broken down into three segments: The Studio Showcase (costumes, props and set pieces), Inside the Magic (a special effects and production tour) and the Catastrophe Canyon experience. And early on, because of the park’s popularity, the trams stopped driving along New York Street. In 2003, the addition of the massive Lights! Motors! Action! Stunt Show arena meant demolishing backstage sets and props areas. Lastly, the new Toy Story Land, which debuted in 2018, and the pending opening of Star Wars Land gobbled up just about any remaining Backstage Studio Tour real estate. Live entertainment was always on the menu when the Disney-MGM Studios was in the planning stages … harkening back to the Imagineers’ original thoughts on presenting a venue which explored the movies, television and the Broadway stage. When the park opened, though, a permanent, covered theater to present live entertainment was still on the drawing boards. A temporary stage and seating area were located near the intersection of Hollywood Boulevard and what would become Sunset Boulevard. Here, “Beauty and the Beast: Live on Stage” was performed several times a day in front of guests seated on temporary benches. As construction of Sunset Boulevard ramped up, “Beauty and the Beast: Live on Stage” was moved to another temporary venue, this one located near New York Street. Sunset Boulevard would eventually be home to the show’s permanent setting, known as Theater of the Stars, as well as the imposing Hollywood Tower Hotel (site of the Twilight Zone Tower of Terror) and Rock ‘N Roller Coaster, starring Aerosmith. After the Beauty and the Beast show moved to its permanent location in 1994, the backstage theater still presented live shows, usually a production to tie into the latest Disney animated release. For instance, “Hunchback of Notre Dame” and “Tarzan” shows were staged there over the years. 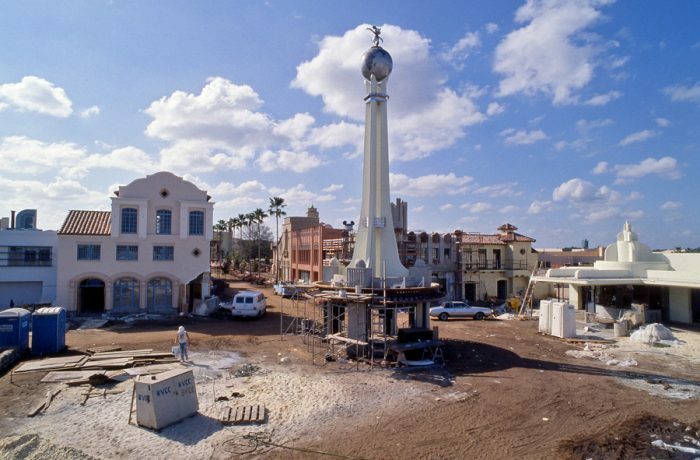 Several months after the Disney-MGM Studios opened, the construction barriers came down in front of two new attractions and the Indiana Jones Epic Stunt Spectacular (August 25) and Star Tours (Dec. 15) were up and running. Over the past 30 years, the Disney-MGM Studios has seen significant changes, chief among them a change in name in 2009. 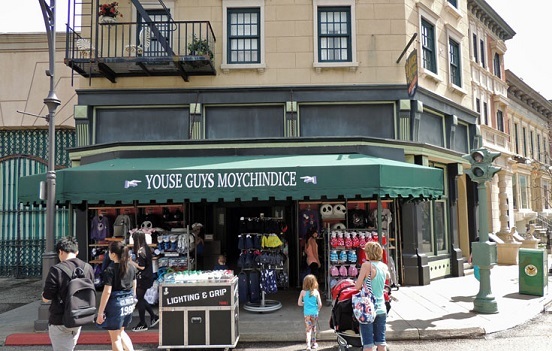 Plus, the basic premise of what is now Disney’s Hollywood Studios has been altered as well – it has morphed from a full working studio into a full-blown theme park, with the magic of Hollywood as its driving force. Last year, Toy Story Land, a true celebration of Pixar’s first major computer animated full-length motion picture, debuted. And later this year, a much-anticipated land devoted to Star Wars joins the Disney fold. Like motion pictures – which transitioned from silent to talking films and black-and-white to color – Disney’s studio theme park has changed with the times into a truly epic experience. Stay on top of all the latest Disney news! Click below to subscribe to the AllEars® newsletter! Previous PostPrevious Briar Rose Gold Treats at Disney World and Disneyland That You Have To Try! Next PostNext Tickets Now on Sale for Mickey’s Very Merry Christmas Party! Chuck Schmidt, bitten by the Disney bug at an early age, remembers watching The Mickey Mouse Club after school in the mid-1950s. During his 48-year career in the newspaper business, he channeled that love of Disney as the Sunday News and Travel editor for The Staten Island Advance. Chuck has written or co-authored six books for Theme Park Press, including Disney's Dream Weavers, On the Disney Beat, An American in Disneyland Paris, Disney's Animal Kingdom: An Unofficial History. Chuck has shared his passion for all things Disney in his Still Goofy About Disney blog on AllEars.Net since 2016. He resides in Beachwood, N.J., with his wife Janet. They have three adult children and six grandchildren. Dang, the park sounds so much better back then with the working studio theme. I loved the Monster Sound Show and my sister and I got picked to participate! It’s funny, there still isn’t very much to do there. I guess the Star Wars geeks will be able to make a full day of it. Disneyland opened July 17th, not the 18th. That one should be committed to memory. Actually, the park was unveiled during a special televised press event on July 17, 1955, which has been long considered the first day of Disneyland. But the official first day of operation, when it was broadcast on the Today show as mentioned in Chuck’s blog, was July 18! They should have updated the Great Movie ride, instead of their horrible new animated version of Mickey Mouse & crew! The odds are, won’t be seeing that at all. First visit summer 1991. I LOVED the Magic of Animation so much. Now that my son wants to be an animator, I wish we still had the option to “tour” the animation offices and look over animators’ shoulders. The closest we’ve come is taking a “class” on a cruise. not the same thing! They need to bring that back !! I remember the first time we went through the Magic of Animation they were doing drawing for the next Disney movie, Beauty and the Beast. It was neat to watch them draw.